Sanu, who is learning how to braid her hair and to cook the same African meal her father makes. Eric, who loves to play baseball with his dad and to dance the merengue with his friends and family. April, who works hard on her Chinese writing and tries to keep up with her family's challenging games. Their stories emphasize the seemingly minor and everyday ways heritage is transmitted: stories, songs, games, language, special occasions. They show the importance of choice and adaptation in forging a cultural identity. And they provoke readers to examine their own families -- what makes them the same, what makes them distinct, and how this uniqueness is celebrated. 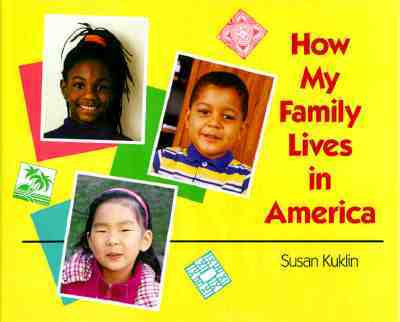 Susan Kuklin is a noted author and photographer of books for young children as well as for older readers. Her seven previous photo essays for Bradbury Press have been hailed as "models of photojournalism for young readers" (The New York Times Book Review), as "notable for their realistic approaches, relatively detailed text, and attractive format" (ALA Booklist), and as "excellent additions to any library" (School Library Journal). Her highly praised books for older readers include Fighting Back and What Do I Do Now? (both Putnam). Ms. Kuklin lives in New York City with her husband, Bailey.